Setsubun means "a separation of seasons" or "the beginnings of each season". It was believed that during a separation of seasons, the devil or bad vibes would cause illness and misfortune. So, a ritual began and people started throwing fried soy beans to drive the bad luck away. As they would throw the beans, they shout "Devil out, good luck in". After doing this ritual, people would eat the same number of soy beans as their ages plus one to pray for another healthy and prosperous year. If you are not a big fan of soy beans, you can put them in your hot tea (green tea usually) and make it a "Fukucha", which literally means "good luck tea". The traditional dinner on Setsubun consists of ehomaki, a special sushi roll that is made with 7 different lucky ingredients and a grilled sardine, which devils hate. 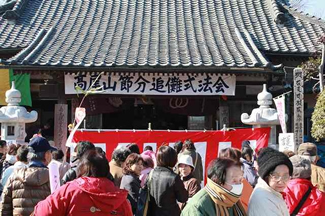 Setsubun has been celebrated at the Hosho shrine for more than 60 years. On the day of the festival, there will be a market called "Setsubun Fukuichi," where local products are sold. Free amazake/sweet hot sake and hot tea with soy beans will also be available. This is one of the most unique setsubun festivals in Gunma because it welcomes displaced oni all over the country. They shout "good luck in, devil in, too", instead of saying the usual "devil out, good luck in" as they throw roasted soybeans. They came up with this interesting idea because the name of Onishi town of Fujioka City in Chinese characters includes oni or demon. Oden/Japanese-style pot-au-feu, tocchanage soup/ a miso soup with vegetables and dumplings, and sweet hot sake will be served for free. Bean throwing will start around 3:30 P.M. and there will be a fireworks display from 8:00 P.M. After going to the events, you can stop by an onsen, since Oigami is one of the well-known hot spring spots in Gunma. The first 100 men who purchase tickets to the event will be given delicious chocolates. As you may know, the Valentine's Day tradition here in Japan is different from the rest of the world! Men get the presents and are pampered! That's not fair, right? But, don't worry ladies, there is a day called the White Day when women get her gifts and are pampered! A total of 2,000 Hina dolls of all shapes and sizes will be displayed at many locations around Tatebayashi city, including the old residence of the last domain head of Tatebayashi, the Akimoto family. Ever since the City of Takasaki tied sister-city relationships with Battle Creek, Michigan and Santo Andrea, Sao Paulo, they have been embracing cultural exchange. This year, the city will celebrate 30 years of multi-cultural exchange and provide an international entertainment show. February 26 (Sun.) Please be aware that the tickets (400 tickets) will be sold from January 11th. 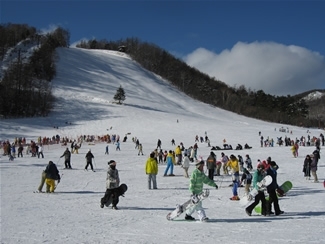 Experience the world in Gunma! Admission is free! We welcome anyone who is interested! In the morning, we have two different seminars, you can either chose "Uganda -The pearl of Africa-" or "If the world were a village of 100 people". In the afternoon, there will be a seminar on volunteering experiences in Brazil and a performance of capoeira (traditional Brazilian martial art). The host of this event, Maebashi People Power Center is affiliated with many different agencies engaged in civic activities. The PePo festival was put together so that those affiliated agencies could give presentations, display their informative panels and open booths where people can try their hand at wood carving, balloon art, aroma therapy and herb tea making. There will be a mochi pounding booth as well.